Dr. Jillian Belrose (right) and Tamara Abood (left). 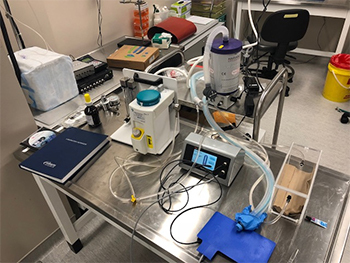 A basic science research project designed by Dr. Ruediger Noppens and Dr. Jillian Belrose (PGY3) is currently underway to investigate the effect of volatile anesthesia exposure on cognition in dementia. Over 500,000 individuals in Canada are currently living with Alzheimer's disease or other forms of dementia. Dementia can greatly impact length of hospital stay, morbidity, mortality, and costs to the Canadian health care system. The project is funded by an Internal Research Fund from the Department of Anesthesia & Perioperative Medicine. 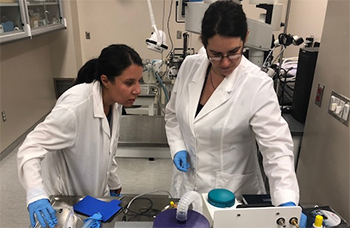 In collaboration with Dr. Marco Prado & Dr. Vania Prado (Scientists at Robarts Research Institute), and with the assistance of Tamara Abood (research technician), the group is employing a transgenic mouse model with Alzheimer's-like pathology to investigate whether exposure to volatile anesthetic agents produces cognitive impairment. Investigators will also assesses whether anesthesia exposure alters the pathological changes known to occur in Alzheimer's disease.